When a motorcycle was ridden at great speed along the highways and byways of the Borders region during the 1920's and 1930's, people would simply remark, 'Guthrie'. 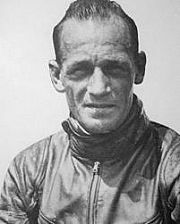 A motorcycle racing legend long before his untimely death at the German Grand Prix of August 8 1937, he was three times a European champion. His name is commemorated at two tracks: the Isle of Man TT circuit and the German Sachsenring that claimed his life. This booklet is for sale in the Wilton Lodge Museum.